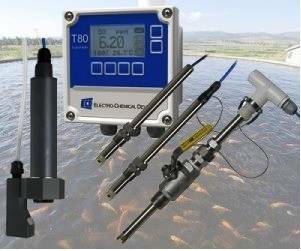 Aquaculture operators in search of a better way to automate testing for dissolved oxygen (DO), pH, nitrate and other parameters will find the modular plug-n-play T80-S80 Analyser System from Electro-Chemical Devices (ECD) simplifies operations and lowers total operating costs. In aquaculture, the reliable detection of rising levels of DO, pH, nitrates and other parameters is essential to keep fish healthy. These parameters can reach toxic levels quickly or facilitate conditions that lead to disease affecting the health of fish, which requires additional treatments or can cause the death of the fish. While many operators rely on portable sensors, they require staff time to manually complete the testing on a fixed schedule that can be hard to maintain consistently during their busy work day. The challenge and expense of dedicating staff time to testing becomes incrementally problematic in larger or remote operations. The installation of fixed analyser systems, however, such as the rack-mount ECD T80 Universal Transmitter with S80 Intelligent Sensors automates the measurement process. The T80-S80 Analyser System can be seamlessly integrated with popular control system communication protocols to provide a closed-loop water monitoring and treatment system that maintains water quality for optimum fish growing conditions. The T80 Transmitter’s own highly intelligent digital protocol simplifies installation set-up and process measurements while also reducing maintenance costs. The two-channel model offers membrane switch navigation, a simple menu structure and soft key menu choices with an easy-to-read 2 ¾ -x- 1 ½ inch LCD display. The T80 accepts any S80 intelligent sensor or any standard pH sensor with solution ground using the optional T80 input card as an input. It is available with 4-20 mA output with MODBUS RTU on 24 Vdc and 110/220 Vac instruments. The T80 can be configured with optional HART® 7 communication protocol and an optional three alarm relay. The T80 Transmitter digitally communications with any S80 Sensor, automatically uploading the sensor’s calibration data and configuring the transmitter’s menus and display screens to the desired parameter. S80 Sensors feature a choice of two universal sensor designs: Insertion/Submersion or Valve Retractable with flared end to prevent blow out. They have a rugged ¾-inch OD 316 stainless steel body with a 10-foot cable or an optional waterproof detachable cable assembly. The versatile S80 DO Sensor features a measurement range from 0.00-20.00 ppm (mg/l) over a temperature range from -10° to 60°C. For pH, the S80 features a measurement range from 0.00 -14.00 pH with a temperature range of -10° to 90°C. To monitor nitrates, the S80 Sensor has a measurement range of 0.1 ppm to 14,000 ppm (3-11 pH), 7×106 molar to 1 molar NO3 over a temperature range from 0° to 40°C. With the S80 Sensors, the economical auto clean option includes a solenoid actuated spray cleaner using either 30 psi process water or air. An easily adjusted timer controls the period and duration of the cleaning cycle. The auto clean option pays for itself by reducing time consuming manual maintenance routines, which frees staff for other more productive activities. Combining ease of set-up, modular design and low maintenance, the T80-S80 Analyser System is ideal for demanding aquaculture applications. From single point of measurement to monitoring multiple parameters, the flexible T80-S80 Analyser System is an economical automation tool for economical aquaculture production operations.